Foundering Flyers look to Phantoms for help, and make all the right moves. Enter the Lehigh Valley Phantoms. With a forceful 3-0-0-1 start to their 6-game road set, they are once again rising to the top of the difficult AHL Atlantic division for the third straight year (previous 7 years? Not so much..). 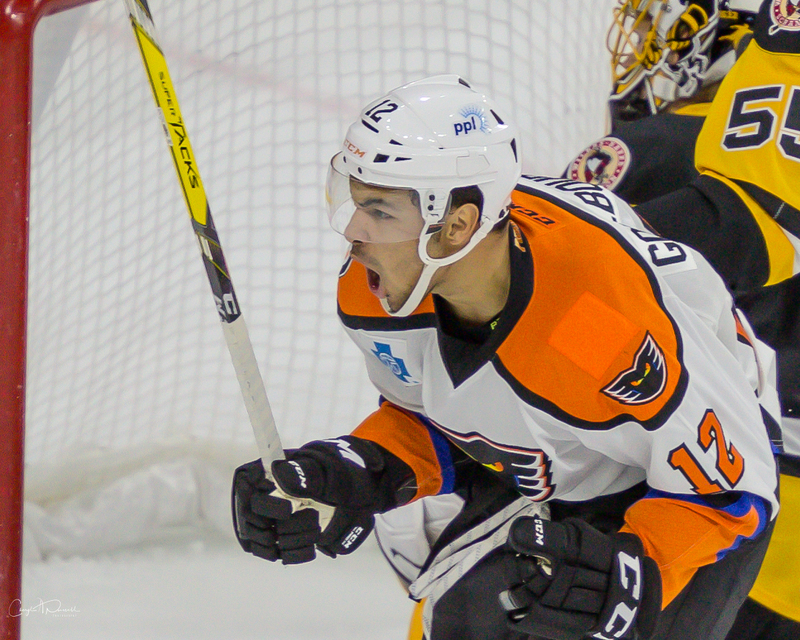 The first call-up today for the Flyers was physical Phantoms forward Tyrell Goulboune, a PPL Center favorite. With no emphasis on fighting anymore, Tyrell has known over the past two seasons that if he’s to make the NHL club, he needs to have as much of an all-around game as he’s capable of. However, with a cameo in the big league last season under his belt, he will know what’s going to be asked of him. In a situation where the team’s effort is lackluster, he’ll be tasked with playing with his hair on fire and not backing down. Make no mistake, not saying that he’s going to be tasked with fighting–just saying that if the situation presents itself, he’ll to be ready. The fly-guys need a spark and he has a chance to be that guy with hard play and a physical presence–fisticuffs or not. And if the team needs to sit him in the press box or let him languish on the bench, then so be it–his game is about where it’s going to be, regardless of playing time. He’ll be ready when called-upon, regardless. And if things revert to the expected? He’ll be back with the Phantoms plying his trade as the PPL Center faithful so appreciate. Congrats go out to Nicholas Aube-Kubel tonight, on his first call to the big club, and the top level of hockey in the world. Two seasons ago, I can say that young NAK was over-matched in the American League–but last season? He was a different player. He didn’t get to the NHL, but his physical play, contribution on the score sheets, and strength on the puck were noticeably improved–something I wrote about very early in the season last year. Now this season? Even better. His contribution skating on the right wing of the top line and remaining there on the first power play unit…he’s been even better, and the score sheet shows it. Late in the season last year he was taking the physicality a bit to the extreme, resulting in a couple of suspensions for errant elbows and the like. We haven’t seen that out-of-control stuff this season, and he can perhaps play strong and finish some chances at the next level. If things go really well? Yeah, it’s possible that we don’t see him again. Good luck, Kubes, we’ll be OK without you! The Phantoms get Misha Vorobyev back from the Fly-guys. The young center had made the big club out of camp, but after getting scratched a couple games and languishing on the bench on Saturday whilst the Flyers were getting blown out, it was clear that he didn’t have the confidence of the current head coach. Kudos to the front office for getting him back to the Phantoms where he can play his game. I’m confident that he knows what he has to work on for the next level, and that he’ll be given every change to do that. With NAK leaving the RW on the 1st Phantoms line, we await clarity on who will fill that position going forward. As the Phantoms take the ice late this afternoon in Hershey, it looks like Cole Bardreau will get the first shot at that spot. The veteran Chris Conner could also appear there, as well as Captain Colin McDonald or maybe rookie David Kaše, who has been handled carefully coming off an injury in his first season in the American. Carsen Twarynski is a fan-favorite, but has been struggling early on, and will work at LW with Vorobyev on the third line while Taylor Leier will look to raise the fortunes of the second line alongside center Mike Vecchione and RW Chris Conner. Although, rookie Connor Bunnaman will fill in there today. Kaše, Rubstov and McDonald make up today’s fourth line. We’ll watch this going forward as the third game in three days is not always the best time to evaluate lines. As for Leier? Well, he’s been conspicuously absent from the score sheet since returning from the Flyers, but will certainly appear on the short list for future roster moves depending on what the parent club is looking for. We’ll look for him to do important things on the ice in upcoming games, regardless of the box score. I think the Flyers will get the spark they so desire and require, on their upcoming western road swing. The Phantoms will be fine, battling on the road and coming home for more home games during November. Future adjustments can be made as needed. For now, they’ve made all the right moves.